It was in November 2006 when Google bought youtube for $1.65 billion from three PayPal employees. Since then it has raised its bar. Now YouTube is a 2nd largest search engine after Google worldwide. Almost 300 hours of videos are uploaded to youtube every minute. Near about 5 billion videos are watched on YouTube every day. Most people prefer to watch videos rather than reading text may be this is the reason for its huge success. This unknowingly gives a platform for those businessmen who want to reach out to the customer. But that is not that much easy to be successful on youtube. You have to follow the rules and regulations YouTube has. 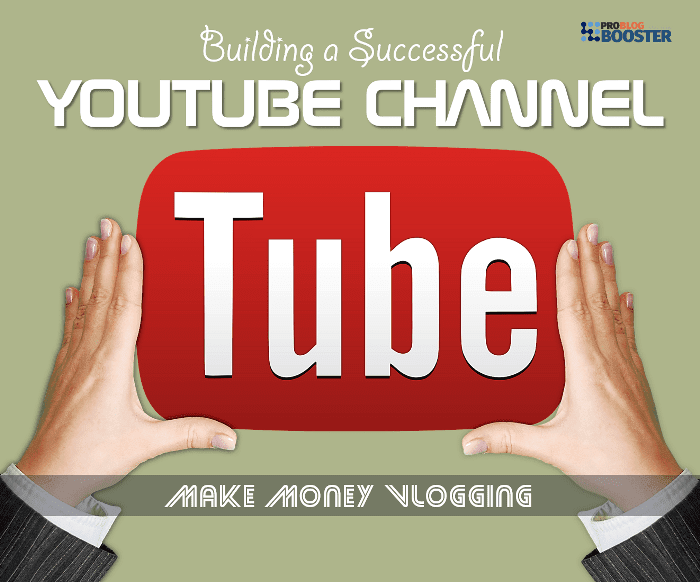 So here I am going to share a comprehensive guide along with the most important tips to build a successful youtube channel that not only help you making money online but to grow yourself as a brand. So anybody can register and join YouTube now and start uploading their creative videos, starting a new YouTube channel and keeping it running successfully for getting a regular viewership is simpler. 1. Name of the channel. The channel name is what you will be known on. It's nothing but your online identity. The name of your channel should indicate the type of content you want to show to viewers. So choose your channel name very wisely. Keeping your channel name easy to pronounce & simple to remember that attract the people's attention; this will be an added advantage. To select the channel name first you have to plan for what kind of videos you gonna create in future. As there are loads of videos uploaded on YouTube every minute, you have to do something unique to stand out from others. Do something different that you should be known as a creator who really creates world class videos. You may also consider the trending words to include into the channel name, that will drive more subscribers and so the views for your channel videos. Whichever field you choose or whatever you do, quality is an important factor nobody can even think of compromise with. At the initial stage, its OK, if you don't have the basic things like HD recording camera or sound equipment. But once you are establishing yourself as a YouTuber you must consider the quality. A video with the best picture quality really impresses the viewers. Sometimes it may happen that, you have a great content but due to your low-quality video viewers discontinue watching after a few seconds. You will experience this a lot if you are doing it for your business promotion. So strictly keep in mind that, that should not happen. To shift this choose the best HD or 4k camera that picturizes really best quality videos. Select a camera which shows every detail even in low light. 3. Not too short, not too long. The world has become fast. People seem to have no time to look for other things besides their work. If they want to watch something on youtube, they mostly prefer shorter videos. If you are creating longer duration videos, that will give a chance to other channels who have shorter videos to come over you. Keeping this thing in mind make your videos shorter. But closely remember, that should not be too short. Do you think a 15 seconds video can detail all the things, you want to show? No, that certainly will not help you, even it may push viewers to search for other channels to get more information they want which obviously you unable to give them. 4. YouTube SEO - Use proper tags. Targeted keywords (Tags) allow your video to get in search results. More specific or relevant tags helps to get your video up in search results. For example; if your video is about speaking English like an American, then the prioritized tag should be "How to speak English like an American" which is followed by the tags like "speak", "English", "An American" etc. Tags are single words or phrases. Don't place tags in the description, this is known as tag stuffing which may lead to a removal of the video. Note this; consistent posting is the best way to stay in subscriber's memory. Consistency is the reason you are remembered by subscribers regularly. Don't let subscribers to wait too much for your next video. It's not that they won't see your video but, still, they have many options. Once subscribers turned to other channels, they might not look back to your channel again. So be consistent to post new videos at regular intervals. If we have to take an example, PewDiePie – which is the biggest channel on YouTube with about 40 million subscribers, has the habit of posting new videos every day. That may not be possible for everybody but you can push yourself to post one to three videos per week. Metadata refers to the information of your youtube video that includes title, tags, description, keywords, annotations. Video SEO (Metadata) is very important to get your youtube video in search result. Metadata allows you to mention the importance of your video, means why viewers should watch your video. Googles says video SEO with meta information assists the viewers to get why your video is that much important to watch for them. While using meta data, the proper precaution should be taken that you must not use metadata which is irrelevant to your video title /subject. Its seems; the new Youtubers has the (wrong) tendency of using some popular words or names to increase the number of views. But using irrelevant metadata may become the reason of bad reputation and so causing more chances for the video to be removed. 7. Embed on your website. Some followers tend to follow their favorite blogger & share everything that they post. In case you have a blog or website which has some followers, you can make use of it either by embedding your youtube videos on your blog/website or posting a link for your youtube channel on your 'about me' pages. As the people following your website; it's a possibility that they may turn to active and permanent subscribers of your youtube channel. If you succeed in it, you win the battle to drive more views to your YouTube channel. The title should be short, catchy & touchy which should create the curiosity & interest about your video in the mind of viewers. Your main keywords should be the part of your video title. Don't forget to enter the main keywords at first. It should be able to explain the entire video subject. 9. Relationships with other vloggers. Whenever I go to any unknown place, I try to find out people who relate to my age or my profession & that is because I feel comfortable and have something to talk about & share. I think that happens with almost every single person ones in their life. The same sort of equation is possible with the vloggers. Try to build a relationship with vloggers who have similar niches. This is not gonna happen overnight, it may take time to collaborate with other vloggers. But surely that will benefit you in a way when their audience will start to know you & vice versa. Promote the videos with collaboration on your channel & ask them to do the same for you. This is an easy but most effective route to get new subscribers & increased number of views on your video. You can give a shout - out to the channel you want to collaborate with & ask to do the same for you. Nowadays it is very obvious to say that social media has become a part of everybody's daily routine. Almost every single person is communicating through social media every day whether it Facebook, Twitter or Instagram. Therefore social media is a very good plan to reach out the people at the beginning. Promote your video through social media & ask your family members, colleagues, friends to watch your video & share to their close ones. So actively be there on social media to promote your youtube channel. 11. Know your target audience. Not every viewer show interest in your video so it's pretty much fair to know the viewers & subscribers that are really interested in watching your youtube video. It's essential to look forward what the target audience is looking for? What is their area of interest? What are their expectations? Once you got the idea you can create the relevant videos to fulfill their expectations. How much relevant videos you will create that much subscribers you can get for your channel. Let them get the filling that you are so concerned about them & make video according to them. When people watch your videos, think it as they are giving their valuable time to watch your video (although it is for their entertainment) especially when they comment. You should try & respond to their comments to keep them engaged to your channel & also to keep their loyalty alive. The loyalty may go beyond, as a person who they think of a famous youtube personality or a brand really think of & reacts to their comments. Though it might not be possible to react to each & every comment but at least you can check out according to the situation to let them know you care about what they think. If you observe, youtube's top 10 channels are totally based on entertainment. But it is not the case that only parody or prank type of videos can express the entertainment & get the higher rank. If you have the ability to convey your message by entertaining the people, no doubt they will lift you up. Lots of videos are uploaded to YouTube which are based on tutorials, business, review, education etc but the fact is most of the success on youtube comes by making your content entertaining. So whatever your content is, always think of adding some entertainment to it. Even if you create a tutorial video, try to teach with entertainment & let them feel as they are enjoying the learning. If you have the skill, no barrier can stop you. Many people bear some special skill but due to the linguistic ignorance, they are thrown on the back foot. Many people think that if they want to create a youtube channel, they have to post a video in English. But the reality it seems to be different for youtube. One of the most famous channel on YouTube today elrubiusOMG is in Spanish & most importantly it has now more than 27 million subscribers. Youtube is not related to any country, it has spread its net worldwide. Billions of users use it every day. Sometimes if you have the skill, you can create videos in your own language & that is a plus point with youtube. Thumbnail is an image that viewers first see before playing a youtube video. So generating a thumbnail that will attract the viewers is also a tactic to run a successful youtube channel. Showcase the thumbnail in bold colors with large fonts & with an interesting image. That makes easier for your viewers to easily identify more videos from the recommended videos sidebar & it will help you also to get more views. Everything takes some time to settle in, so as a success. Don't be in a hurry. It's all about the consistent efforts you take. Try to be different from others. You can follow your favorite YouTuber. Look what they are doing differently and you can start experimenting. I hope today's description help you what you are looking for. Let me know what you think about all these strategies and if you want to add something you can easily share with the comment section shown below.